Bacterial blight, caused by Xanthomonas campestris pv. pelargonii, is the most serious disease of the florist's geranium. Ivy and seed geraniums are also susceptible while "Martha Washington" is not. 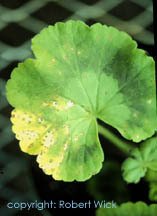 Bacterial blight is not as common as other geranium diseases but cases occur every year, occasionally in epidemic proportions. Geranium producers should be aware of the symptoms and its diagnosis. Plants suspected of having bacterial blight should be examined by a plant pathologist. The bacterium reproduces and moves systemically in the water conducting cells of the plant resulting in wilt. Leaf spot and stem rot may or may not occur. The stem rot phase is occasionally referred to as black rot and can be confused with the black leg disease caused by the fungus Pythium. In greenhouses, the most common symptom is a wilting of one or more leaves even though the root system appears healthy and the soil is moist. However, if root rot is evident, that does not rule out the presence of bacterial blight. Excessive fertilizer can also mimic these symptoms. Leaf spot is less common than wilt but may occur if plants in advanced stages of disease are present. For leaf spot to develop, the bacterium has to be splashed from one plant to another or be underneath hanging baskets that are contaminated. Leaf spots are fairly diagnostic. When leaves are held up to the light, the spots will have dark centers with translucent borders. They may be circular or they may run together resulting in a blighted appearance. Leaf spots are soon accompanied by yellowing, often in a V-shaped pattern. The bacterium will move into the vascular system of the leaf and then into the stem. Other bacteria may cause similar spots but do not result in wilt. Symptoms on ivy geraniums are much less obvious than those that occur on seed and zonal types. The thick waxy leaves do not wilt. In general, the foliage becomes dull and grayish, ultimately resulting in scorched or dried leaves. The symptoms are easily confused with nutrient imbalances or insect infestation. A laboratory diagnosis is necessary to confirm the presence of the bacterium. Cuttings taken from systemically colonized stock plants may fail to root, turn gray-brown to black, and develop a dry rot. Other pathogens may cause similar symptoms. Cuttings with low levels of bacteria may root and not develop wilt symptoms for 10 weeks or longer. When plants are in advanced stages of disease or when leaf spots are present, the bacterium is easily spread by splashing irrigation water and by physically handling plants, especially when they are wet. The use of cutting knives is an efficient way to spread the disease; therefore cuttings should be snapped off of the plant. If cuttings are rooted together in a flat, bacteria are easily spread to adjacent cuttings. Capillary mats under pots also provide an efficient means for spread. It has been reported that whiteflies can transmit the bacterium. There are no pesticide sprays or drenches that will cure the plants or provide adequate protection from bacterial blight. Wilted plants should be removed from the premises. Sanitize tools, flats, pots and bench tops with 10% household bleach or another appropriate disinfectant. Soil can become infested with the bacterium and therefore should not be reused.